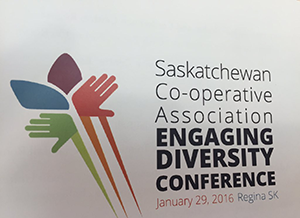 Co-operators from across Saskatchewan gathered to delve into the province’s changing population and its impacts on their future. For co-operatives to survive and thrive in the province, they’ll need to understand how the face of their membership and boards will change in the years ahead. Adam Thome, Member Insights Manager for Affinity Credit Union, presented a portrait of that change. Mr. Thome explained that millennials are already the largest demographic in Saskatchewan, by as many as 50,000. This is quite different to other provinces where boomers are still the largest cohorts. Visible minorities in Saskatchewan represent almost 8% of the population compared to 19% as the national average. This is expected to shift dramatically as Saskatchewan’s population is expected to grow by 25% by 2025 (to approximately 1.25 Million). The most compelling shift in the population, and a point of focus for the conference was, the growth of the Aboriginal population. At present, 25% of people under 15 in the province are Aboriginal and by 2031 this underserved demographic will become 25% of the total population. The portrait is quite clear for co-operatives: human resources and governance needs to reflect the markets you want, and economic growth will be found in Aboriginal communities as well as in immigrant communities. To embrace diversity however, there are cultural differences that need to be bridged. The conferences keynote speaker, Lionel Laroche, delved into the Canadian mindset and offered concrete examples of how cultural traits we learn often divide people through misinterpretation. To reduce the friction with clients, employees, members and board members, he discussed communications and awareness strategies to manage expectations on all sides. Dr. Murray Fulton, Fellow in Co-operatives and Public Policy, Centre for the Study of Co-operatives and Professor, Johnson-Shoyama Graduate School of Public Policy presented his research on Saskatchewan’s rural and Aboriginal demographic trends and their implications for co-operative development. He suggested that creating an understanding of how co-operative values and principles align with the traditional values of Indigenous People is the best approach to engaging Indigenous communities in Saskatchewan. The research, in partnership with Federated Co-operatives, has taken 2 years and took place in all four western provinces. The Embracing Diversity Conference was a proactive look at how to embrace age differences, gender, race and culture to make it an advantage for co-op business. Every province has a unique diversity make-up – and Saskatchewan certainly has a unique future demographic make-up– but this type of thoughtful consideration of how to make demographic shifts work for co-ops is of real value to building the co-operative movement everywhere.